Hello my fellow rock climbers! My name is Ha Roda and I am totally addicted to rock climbing. I have been climbing since April 2013. My son, Zephyr, joined the climbing team in November 2011 when he was eleven years old. I watched Zephyr and his team competed youth indoor climbing for a whole year and it looked so much fun. I wanted to try but I was afraid that I was not strong enough and I may hurt myself. I have a healthy fear of height and most of all falling. I noticed a small group of parent climbers who were my age and maybe older. They had a fun time socializing while climbing. Also, sitting and watching others climbed got boring. I decided to try it out. My first day of climbing was amazing. I wanted more. I found that I used my legs and balance more to climb than my arms so initially it was not all about strength. However, I was totally out of shape so all my muscles were sore for the next few days. I used muscles that I didn’t even know I had. I love the feel of the actual physical ascend up the wall and the feeling of accomplishment when I get to the top. Of course I am attached to a rope and there is a belayed partner to catch my falls. The fear of falling is always there. However, my focus is primarily on the wall and how I can get to the top. The movement up the wall is like dance steps with constant trouble shooting of easy or effective ways finding my way up to the top. I enjoy a challenging move where I have to balance and maneuver myself to the next hold. There is strength involved such as the core of the body (stomach and all the small muscles in the six packs), the legs (thighs, quadriceps, calves & toes), the upper body (shoulders, back, chest, biceps, triceps, hands, fingers, and forearms). Almost all of the muscle of the body is engaged. My balance, flexibility, and strength are constantly challenged as I climbed harder routes. I enjoy a sweaty challenge when I climbed a 5.10 – 5.12. It is somehow so therapeutic. There’s no worries in the world at that moment. It’s just me and the wall that I am climbing. Over four years, I become more efficient in climbing. I also observe that my arm muscles especially my triceps, biceps, shoulders, and back become tighter and stronger. My stomach flattens further since given childbirth and the unwanted love handles slowly dissolved. My husband said he thinks he may see a six pack lining up. Wahoo!!! All that muscle toning is just the extra perks of doing what I enjoy. 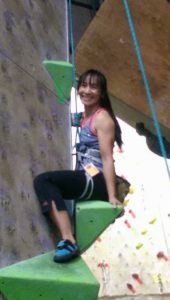 Now I just want to share my experiences and tips as an older and passionate rock climber to empower women in pursuing their passion in rock climbing. It’s never too late! or find me on Google + and FaceBook.